Beyonce can now officially join the ranks of celebrity diva’s whose list of demands certainly raises more than a pair of perfectly-groomed eyebrows. Move over Jennifer Lopez with her white couches and white foods, Beyonce seems to be partial for a bit of red loo roll in the restroom as allegedly listed on the tour requests for the Mrs Carter concerts that are currently underway. She’s got a while to go until she reaches the ultimate diva demands of Mariah Carey, the songstress who famously requested puppies and kittens alongside cases of Cristal and bendy straws. One thing we’ve definitely taken note of is that more celebrity demands seem to be extending from the dressing room to the bathroom, as Simon Cowell also allegedly has a penchant for black loo roll. 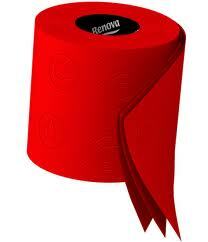 Aside from the Renova Red Toilet Paper below, Red Candy stocks a whole bunch of rainbow-coloured loo rolls to surprise and entertain your guests. 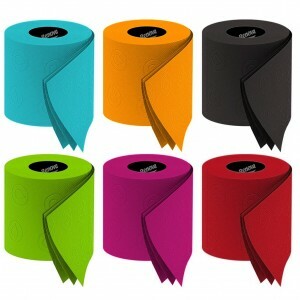 Click here to have a look at the full Renova selection of colourful loo rolls. To style a bathroom like Beyonce’s featuring bright red toilet paper, click here.